Or so goes the old advertising maxim. When Cambria Jacobs, Vice President of Marketing, Door to Door Organics, sat down for an interview at MarketingSherpa Summit 2016 with Courtney Eckerle, Managing Editor, MarketingSherpa, she shared that old advertising maxim along with her team’s journey on social media — from a customer service channel to a unified, proactive, brand-building strategy. “Primarily, we were using social media as our vehicle for customer service,” Cambria said. While her team transformed its use of social media to grow its brand, don’t overlook where the journey began. The ecommerce grocer started by using social media for customer service. Whether you choose to engage in social media marketing or not, your customers are likely already using social media to discuss interactions with your brand. Use social media as another channel to help serve them. Social media isn’t just a megaphone. It’s also a massive digital water cooler constantly providing customer interactions with your brand in real time. As Door to Door Organics’ team listened to its customer on social media, it better understood the impact of its product in customer lives. “There was this feeling of joy that Door to Door Organics could capture,” Cambria said. This new customer understanding eventually helped power the natural and organic online grocer’s marketing strategy down to its tagline — #JoyDelivered. Customers naturally create content about many brands through social media. 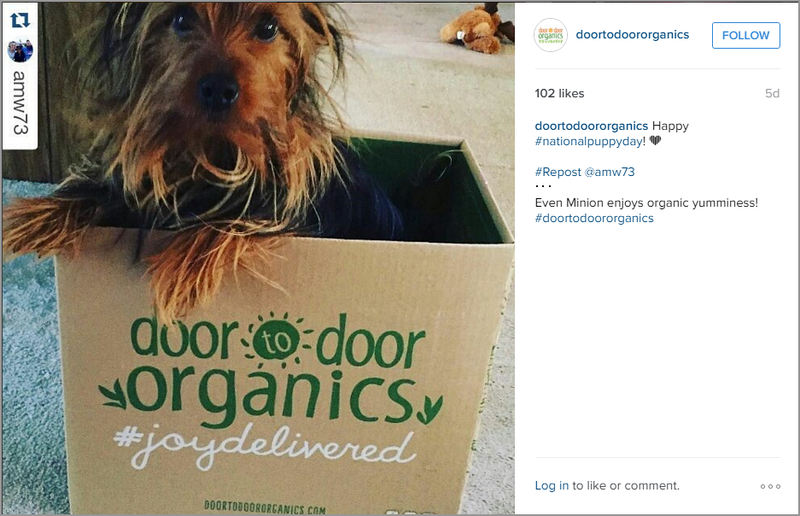 By finding, and sharing this content through its own social media accounts, Door to Door Organics let customers shape and promote its brand to each other. While social media marketing tends to be associated with the word “engagement,” at the end of the day, this is branding in the same way a Super Bowl ad or a nonprofit sponsorship is branding. You can follow Daniel Burstein, Director of Editorial Content, MECLABS Institute, @DanielBurstein.